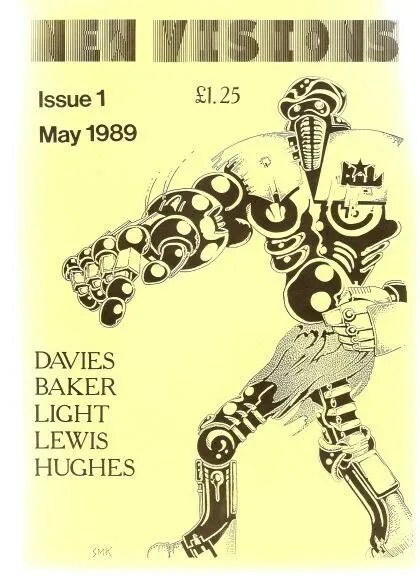 In a different age, Ade Hodges was editor of New Visions, Nova SF magazines etc. I really like his ground-breaking style in painting combining landscapes and abstract in the way he combines them. EDIT (4 Jul 12): A retrocausal painting of Higgs boson from Cern Zoo. Work by Dave Cunliffe, John Light, Bruce P Baker, Dave W Hughes (of Works), David Mathew (yes, that one, very young! ), Kevin Lyons (of The Scanner) and others. Cf: the image on the right in the new painting with the image on the magazine cover!